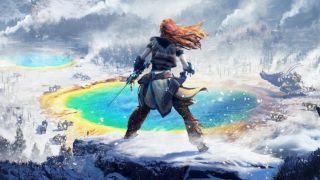 Horizon Zero Dawn: The Frozen Wilds, the first DLC for the PS4-exclusive game starring all manner of impressive robot creatures (and heroine Aloy, of course), will arrive in the appropriately chilly month of November, Guerrilla Games announced today. Specifically, The Frozen Wilds' release date is November 7. The DLC is still largely a mystery, though we know it will add new story, a new area, and new robo-creatures to fight. And as you probably could've guessed from the title, it takes place in a snowy region of the Horizon world. There's an ominous, smoking mountain, and mention of a beast guarding it, so no doubt Aloy will have her work cut out for her when The Frozen Wilds lands. While we can't be sure, there's convincing evidence that The Frozen Wilds takes place in Yellowstone, and that at least one of the new beasties is a robo-bear. Or gorilla. Either way, should make for some great Horizon photo shoots. SteelSeries Arctis 9X review: "The new best Xbox One headset has arrived"